1Regional Ayurveda Research Institute for Metabolic Disorders (CCRAS, Min. of AYUSH) Ashoka pillar, Jayanagar, Bengaluru-560011, INDIA. 2Central Council for Research in Ayurvedic Sciences, Ministry of AYUSH, Govt. of India, Janakpuri, New Delhi-110058, INDIA. Objective: Goraksha or cluster beans are an annual legume found throughout India. It is also extensively cultivated for its pods used as vegetable for its high nutritive value, antidiabetic properties and for the source of guargum. Methods: Macroscopy, microscopy, powder microscopy, histochemical studies and preliminary phytochemical studies on the pods of Goraksha has been carried out highlighting its importance along with important diagnostic characters, which will help in the identification of pods both in fresh form as well as in dry form. Results: Study revealed presence of distantly arranged elongated uniseriate warty trichomes in the outer most layer of epidermis, presence of stone cells, simple starch grains and very small calcium oxalate crystals in the hypodermal region. Presence of unevenly thickened row of palisade layer of macro sclereids in the outer most layer of cotyledon region. Phytochemical studies revealed the presence of alkaloids carbohydrates, phenols, proteins, saponins, starch, steroids, and tannins. Conclusion: The pharmacognostical standardization revealed the presence of various specific characters which are important for the identification of the genuine pods of Cyamopsis tetragonoloba (L.) Taub. Keywords:Cluster beans, Goraksha, Pharmacognosy, Pods. Histochemical studies. Fresh Plant of Cyamopsis tetragonoloba with pods; A-fresh pods, B-dried pods. Ramasheshan ST, Pitchaiah P, Maramreddy PR, Bharti V, Ramakrishana KK, Gaddam V, et al. 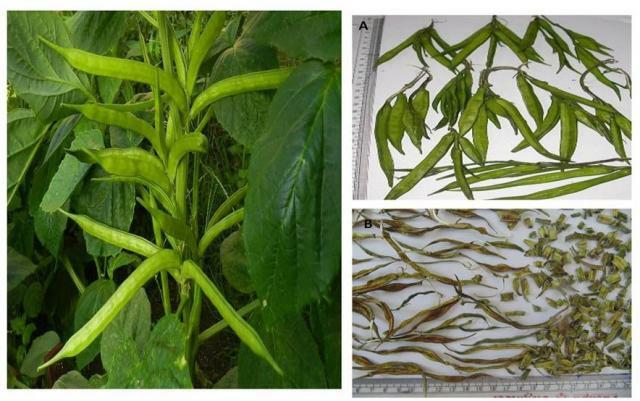 Pharmacognostical Standardization of Goraksha pods: an important Nutritive and antidiabetic Plant. Pharmacognosy Journal. 2016;8(5):424-429.